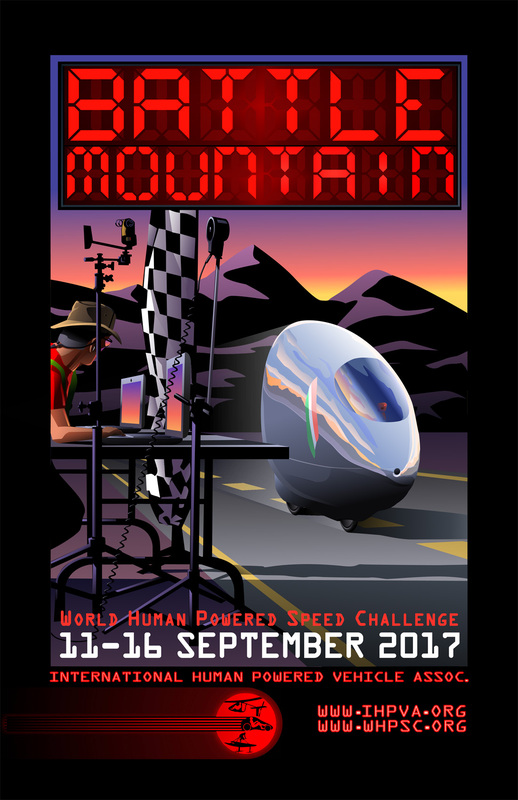 During the week of September 11th through September 16th 2017, cyclists from around the world will gather on State Route 305 outside of Battle Mountain, Nevada in a quest to break the human-powered land speed record. The record currently stands at 89.59 MPH (144.17 KPH). This will be the 18th consecutive year of competition at this site, home of one of the straightest, flattest and smoothest roads in the world. The 4,619ft (1,408m) altitude course provides an acceleration zone of 5 miles leading to a 200 meter speed trap. The highway was repaved in 2009 and special consideration for this particular section of road to ensure utmost smoothness for the WHPSC was given by the Nevada Department of Transportation. 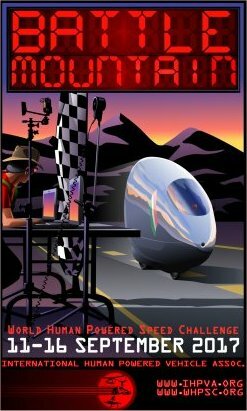 The overall speed record at 89.59 MPH (144.17 KPH), by Todd Reichert of Team Aerovelo. The Junior (17) record at 65.93 MPH (106.10 KPH), by Florian Kowalik of Team GeeBee. The Womans Hand-Powered record at 24.85 MPH (39.99 KPH) by Sarah Piercy of the University of Plymouth team. The Mens Multitrack record at 73.95 MPH (119.01 KPH) by Gareth Hanks of team Tri-Sled. Copyright 2000 - 2016 All rights reserved. Web design by Warren Beauchamp.